These are available at a suggested donation of 20p per card and envelope (+ postage)- these can then be sold (at talks, through volunteers, etc) at £1, £2 or for a donation. Little bro': "What's an angel?" Bigger bro': "It's like ......... a dude with wings." CharismaArt is a newish company who manufacture and sell contemporary fine art with a Christian theme. 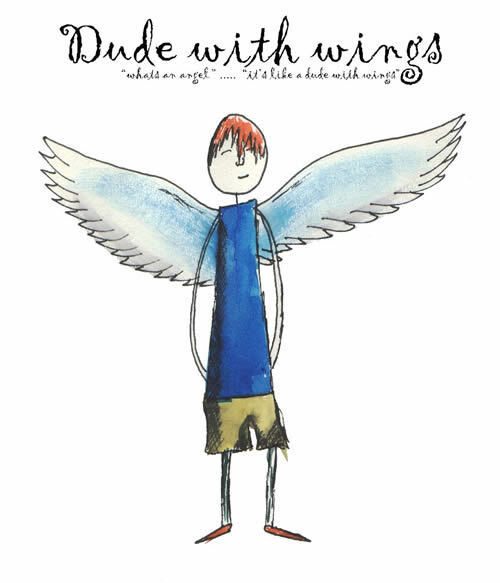 Based in Halifax they have followed the Street Angels - CNI Network story with much interest. 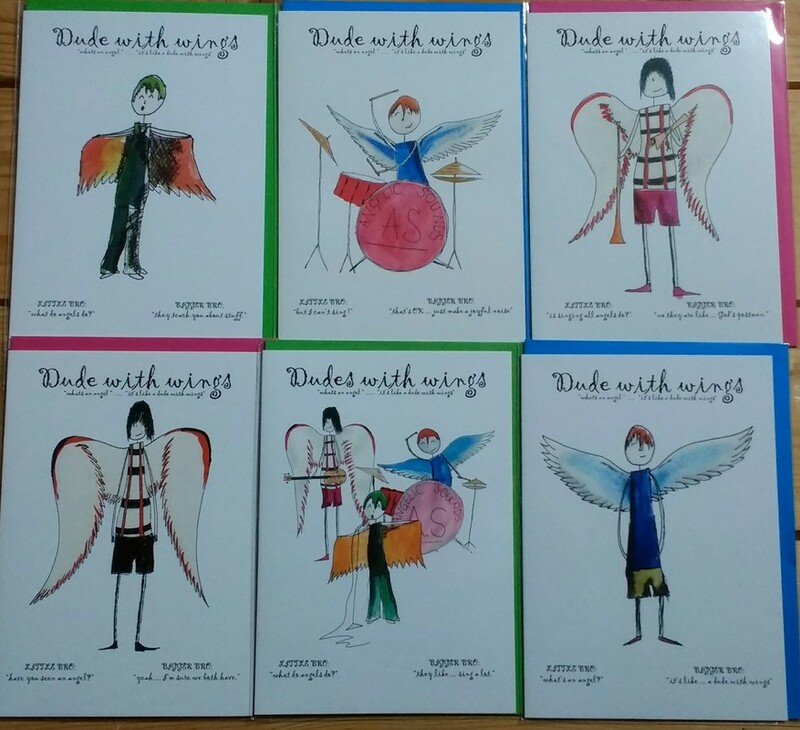 Seeing the value in what is achieved each week on the streets they wanted to offer the "Dude With Wings" range to local groups to help with fundraising. All have heading "dudes with wings" "what's an angel .... it's like a dude with wings"
Scripture: Psalm 91:11 God has commanded his angels to watch over you and protect you wherever you go. Bigger bro’: “they teach you about stuff." Scripture: Daniel 9:21-22 Gabriel, the man I had seen in the earlier vision, came to me in swift flight about the time of the evening sacrifice. He instructed me and said to me, "Daniel, I have now come to give you insight and understanding. Bigger bro’: “yeah ... I'm sure we both have." Scripture: Hebrews 13:2 Don't forget to show hospitality to strangers, for some who have done this have entertained angels without realizing it! Bigger bro’: “they like ... sing a lot." Scripture: Revelation 5:11-12 Then I looked again, and I heard voices of thousands and millions of angels around the throne of the living beings and elder, And they sang in a mighty chorus: "Worthy is the Lamb who was slaughtered to receive power and riches and wisdom and strength and honour and glory and blessing." DWW5 - Little bro’: “but I can't sing!" Bigger bro’: “that's OK ... just make a joyful noise." Scripture: Psalm 98:4 Make a joyful noise to the Lord, all the earth: make a loud noise, and rejoice, and sing praise. Bigger bro’: “no they are like ... God's postmen." Scripture: Luke 1:19 The angel answered, "I am Gabriel. I stand in the presence of God, and I have been sent to speak to you and to tell you this good news."